Be a Girls on the Run 5k SoleMate! As a 5k participant, you can fundraise to support Girls on the Run NYC! We invite you to sparkle & shine for our girls as a 5k SoleMate. Spread the word to your friends and family about Girls on the Run and your upcoming 5k, and earn fun Girls on the Run gear when you fundraise! Help us make a positive impact on more girls across NYC. $350 can support a full season scholarship include running shoes and healthy snacks for one girl in our program. As a 5k SoleMate, you will be honored at the 5k and will get fun GOTR swag at the 5k to show off your Girls on the Run pride. When you sign up to run or volunteer at the Girls on the Run 5k, you can also create a fundraising page through the registration process! Already registered? Click here to create your fundraiser. Read on for fundraising templates, ideas and helpful tips! GET YOUR GIRLS ON THE RUN SWAG! Pick up prizes at the Girls on the Run NYC SoleMates tent on the day of the 5k! 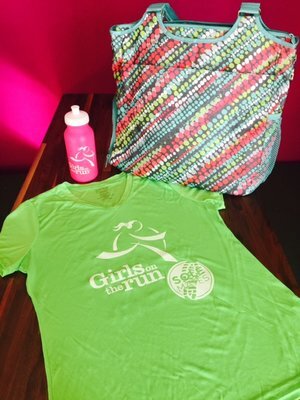 *$1,000 earns you a tech shirt, gym bag & GOTR swag! Thanking your supporters! Each time a donation comes in, thank your donor. Whether it’s just sending a quick email or posting on their social media, it means something to your supporters! A great time to send thanks is when you cross the finish line at the 5k! Take a quick photo or video to let your community know that you’ve finished the race - and that their gift makes all of this possible! Sending weekly updates! Let your supporters know how you’re doing - it can be posting a picture of your run that morning, a quick rundown of how much you’ve raised (and how far you have to go), or a countdown until the 5k. Studies show that people who provide campaign updates raise SIX TIMES more support than those who do not. Ask if your supporters have matching gifts through their company or organization. Many companies in NYC match up to double or triple their employee’s donation - which is huge (and goes towards your total impact). Check in with your friends and ask your friends to check if their employee matches gifts. Send GOTR NYC updates along the way so that we can connect, elevate your work, and make sure you have everything you need for a successful and fun fundraiser. Reach out at any time -- we’re here to support you! Contact us at 5ksolemates@gotrnyc.org or call our office at 212-401-6380! Want to use Facebook instead to fundraise? Select Nonprofit/Charity: You’ll be asked to fill in the name of the organization. Be sure to fill in “Girls on the Run: NYC." A common mistake is choosing “Girls on the Run” as your sponsored organization. It’s the first one that pops up, but it is not Girls on the Run NYC. Girls on the Run NYC’s facebook fundraising page can be found here or by searching “Girls on the Run NYC” in your fundraising set up page. Why This Matters: You must choose “Girls on the Run NYC” for your funding to come to our council, Girls on the Run NYC. Sometimes the main headquarters or other councils will occasionally show up above Girls on the Run NYC. Check out examples of these below, including a cover photo and sample language. Set a goal & timeframe that makes sense for you -- including a plan for a stretch goal if you hit your original goal! Goal: We encourage you to set a goal of at least $350, and consider aiming for $1,000! End date: We recommend setting the end date for AFTER the 5k (which is June 13). Click Invite next to the friends you want to invite to contribute to the fundraiser. Below follows an editable option for your fundraising “about” section - feel free to adjust and use what makes sense to you! “Join me as I run for a cause - lacing up for Girls on the Run NYC! Girls on the Run NYC inspires girls to be joyful, healthy and confident using a fun, experience-based curriculum which creatively integrates running. We work to build a world where every girl knows and activates her limitless potential and is free to boldly pursue her dreams. But they can’t reach those goals without our support. Currently, more than 60% of the girls in the Girls on the Run NYC program come from low-income communities. Funds raised by motivated runners during the 5k - like me! - provides these girls with full scholarship and subsidy support to participate in our life-changing program, empowering them to be confident, healthy and joyful. Your support will help Girls on the Run NYC serve all girls, regardless of financial need. Supporters can make a donation through your Facebook Fundraiser. Supporters can make a donation online through your FUNDRAISING URL if you create a fundraiser through this link. Please note: you will need to provide your supporters with your unique URL. Supporters can also make a gift offline by writing a check with your name in the memo and mailing it to Girls on the Run NYC, 81 Prospect Street, Brooklyn, NY 11201. By adding your name to the check memo, we will apply it to your fundraising campaign! Example: Janey Smith, GOTR 5k. Contact us at 5ksolemates@gotrnyc.org or call our office at 212-401-6380!